I found this lovely vintage hand painted porcelain music box at a thrift store for less than $2. It was coated in a brown veneer of cigarette tar from spending a couple decades in a smoker’s home. Probably due to the very dirty condition, no one had given this gorgeous piece a second glance. 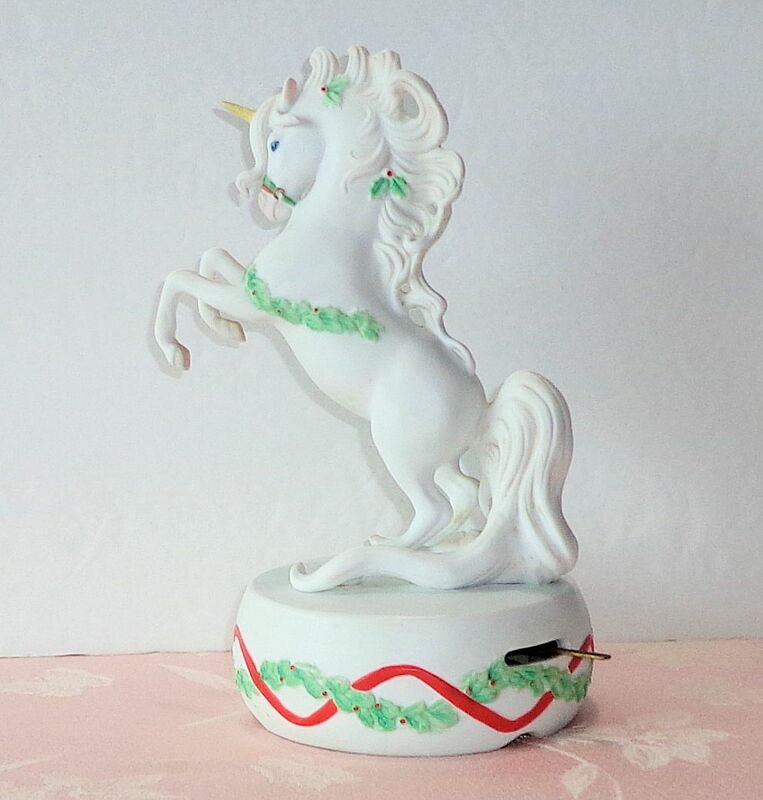 The music box is from 1988 and is a rare holiday edition from a series called Elusive Legend by Enesco. 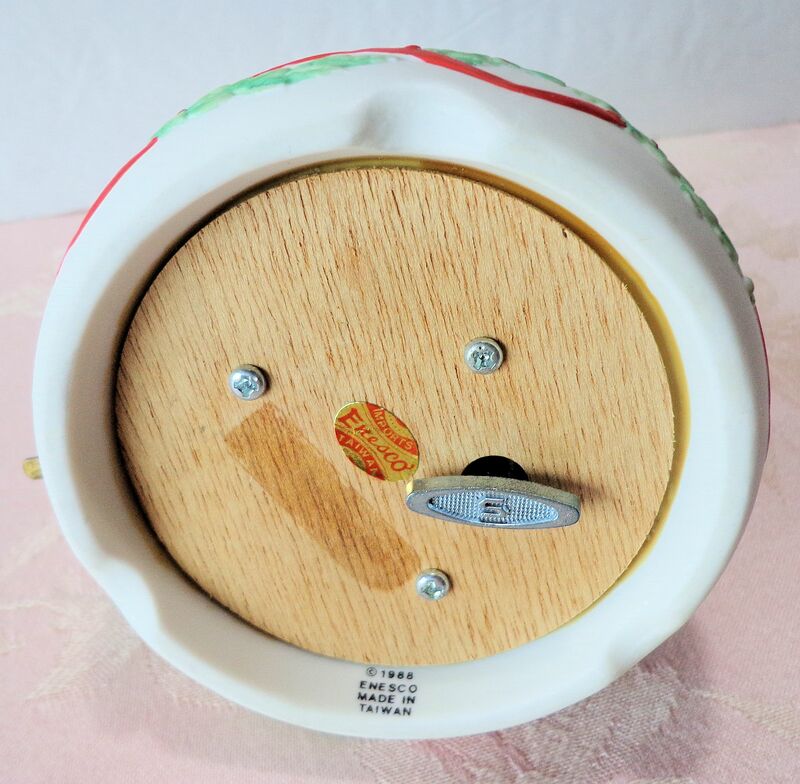 It was made in Taiwan and measures 7.75″ high. The music is Carol of the Bells. This piece is exquisitely modeled and carefully painted. Enesco started in 1958 as a subsidiary of N. Shure Co. (NSCo, sound it out!) It was the arm of the company that imported items, mostly from Asia, for sale in the US. The musical movement works perfectly and the porcelain has no damage. The metal music box itself is by Schmid, a manufacturer renowned for high quality. I spent about one-half hour carefully cleaning the smoker’s build-up. The mess needed to be removed without getting any water into the metal workings. Once I saw how beautiful it was, I wanted this for myself. I’m a huge fan of anything horsey. Then I checked the value. This item is rare and sought after. It is worth about $200. 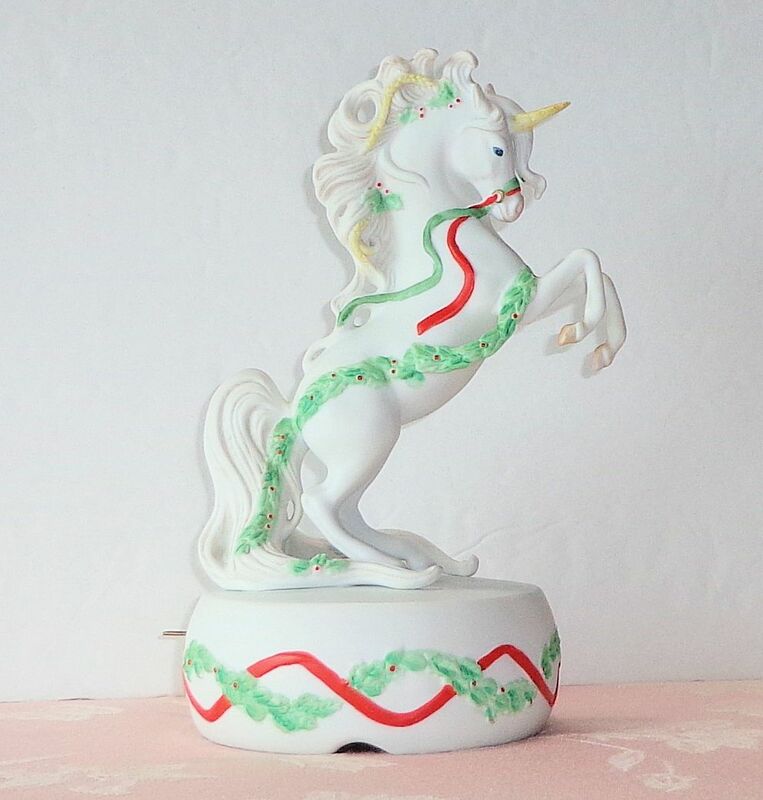 Sadly, I must sell the little unicorn, I can’t afford such an expensive bit of decor. I’m sure it will go to a very deserving person. The piece is in my eBay shop. The last brood of chicks for the year hatched yesterday, on the Solstice. 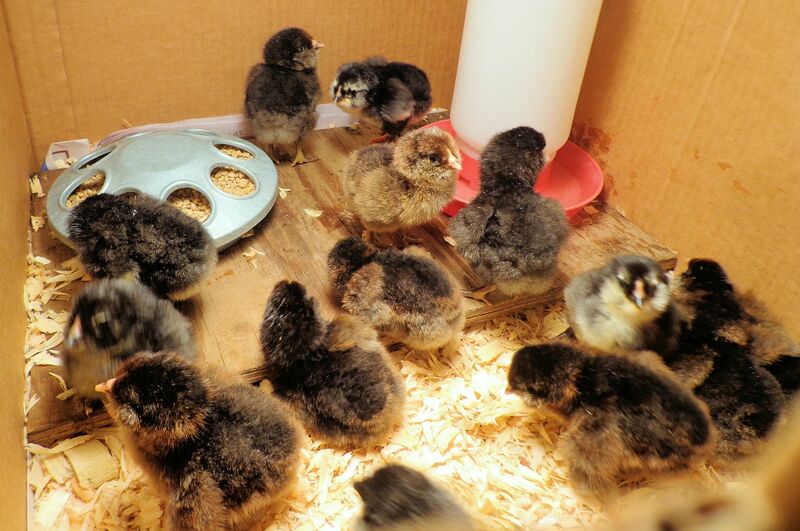 Twenty out of twenty-one developed eggs hatched, a 95% hatch rate. I’m very pleased. These babies are so cute, active and inquisitive, nice little Silver Ameraucanas. It’s great to have the hatching done for the year. No more worry about the power failing, the equipment malfunctioning or needing to add water every day for humidity. Now I just have to get these little ones through their first week and out in the barn. 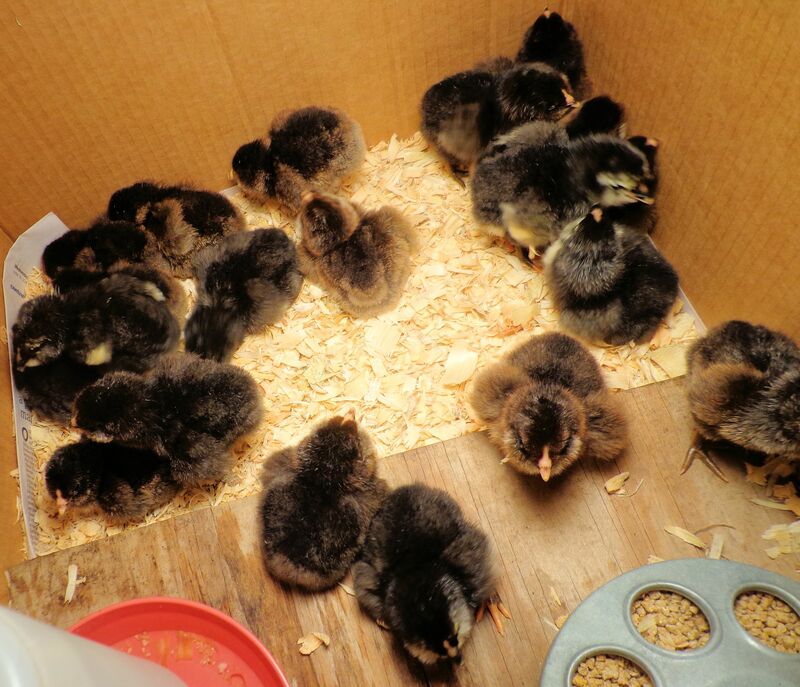 Chicks in the house is fun for the first couple days then the smell and dust and cleaning get old quickly. It is entertaining to watch their antics as the chicks explore and learn. They are very unsteady on their legs the first couple days, tripping, tumbling, rolling about and staggering off out of control in odd directions. Quickly, they discover how to control their bodies. By the end of the first week the birds are getting tiny wing feathers and taking very short flights in the box. 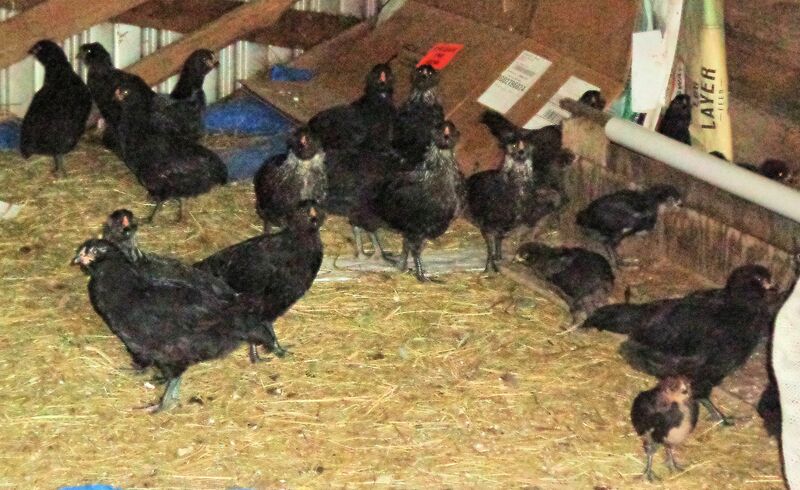 That signals time for the brood to move to a larger cage in the barn. They can practice flying where there is plenty of room to move. Before long these twenty will join their older siblings free-ranging around the barnyard. 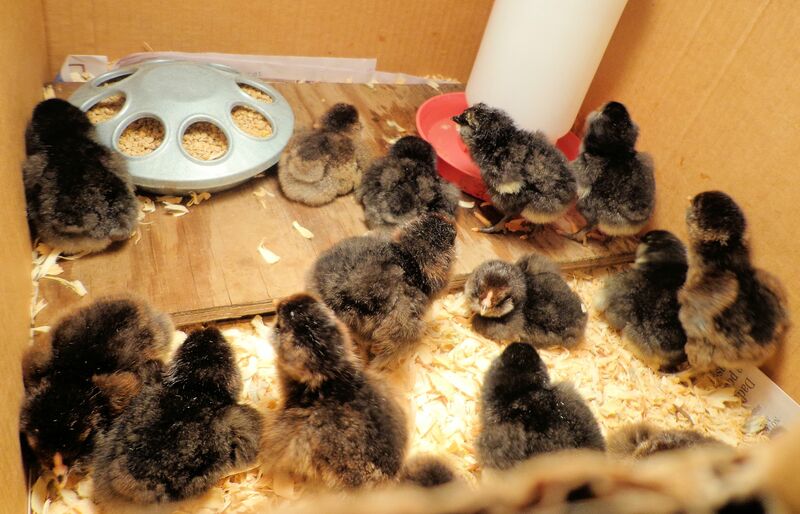 The second and third hatches total thirty-nine chicks. The babies of differing ages have blended together all by themselves into a flock. The older ones seem to delight in leading the younger chicks to all the fascinating corners they have found in the yard. I’m certain that within three weeks this third hatch will swell the flock’s numbers into an impressive gang of chicks. 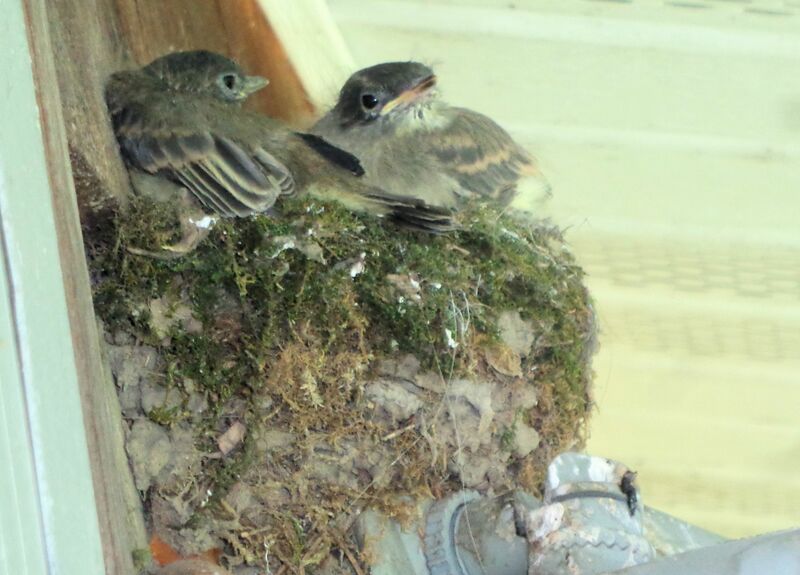 The phoebes are busy with their little family, on top of the floodlight beside our back door. It is cute and sweet and endearing to have them as tenants, but I sure wish they’d leave already! So happy to see the young ones nearly fledged. The Eastern Phoebe is a friendly bird that likes to nest near people. They build under eaves to protect the nest from rain since the female uses a great quantity of mud for construction. Nesting close to humans must help protect the young from attack by more shy animals. Unfortunately, having birds so close to the house makes the cats crazy. For a good part of the spring, the door must be kept closed or the cats climb the screen trying to catch the birds. And the birds yell at the cats incessantly. Keeping the door closed all the time is an inconvenience. I’d love to open it and let the spring breezes flow through the house. Since the birds are quite territorial, it is also aggravating to hang up laundry. The clothes lines are apparently way too close for the birds’ comfort (maybe 15-20 feet away.) They scold and squawk every time we put out the wash. Hey, birds, you picked the spot, quit your fussing! One fall I took down the nest, hoping that would dissuade the birds from returning. No good. The female busily built again in the spring. This year, she tried to nest beside the front door. Luckily, I caught her early before she did much building and blocked the area. So she went up back and reused her old nest. 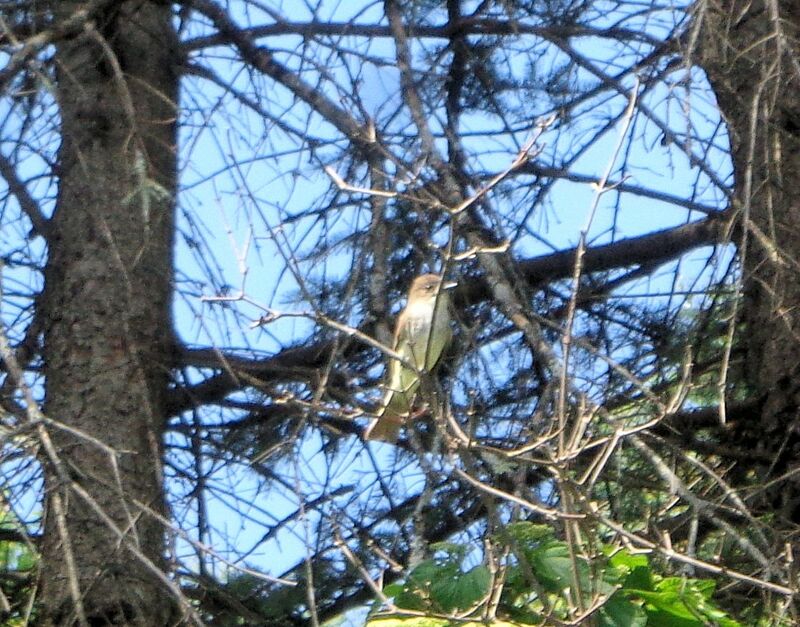 These little flycatchers are nice to have around since they prey on wasps, mosquitoes and black flies. It’s fun to see the babies up close and to listen to the adults say their name as they call. 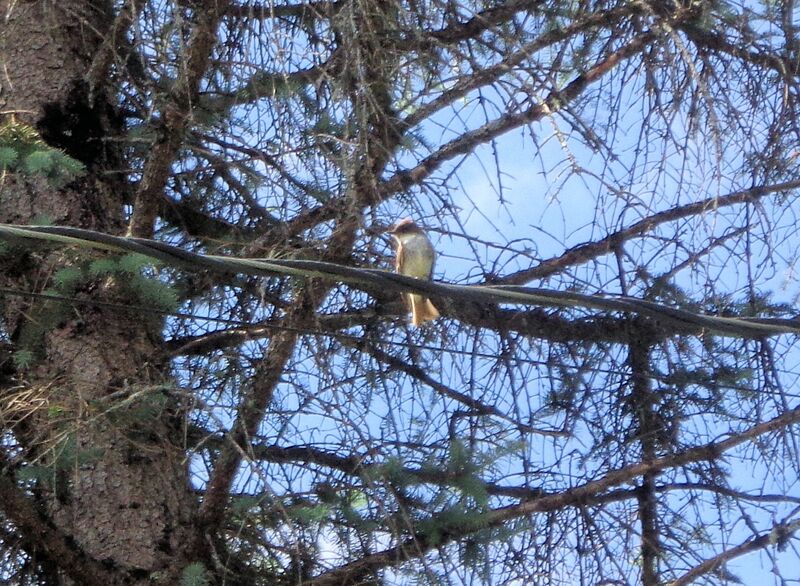 You can always spot the phoebe by the way its tail bobs as it perches. Plus, at our house, it’s the bird yelling at you and swooping close. The adult sexes appear very similar, although the male is slightly larger and darker than the female. I believe the male is in the photo on the left. Only the female builds the nest and she is quite a little architect. She piles on clay mud and lines the nest with soft moss and fluff the dogs shed. Both parents struggle to catch enough bugs to feed everyone. While the babies grow, the parents spend the entire day catching insects and bringing them to the nest. The bad news about phoebes is they like to have two broods per year. So the tantalizing of cats and annoying of humans will likely continue here for at least another month. 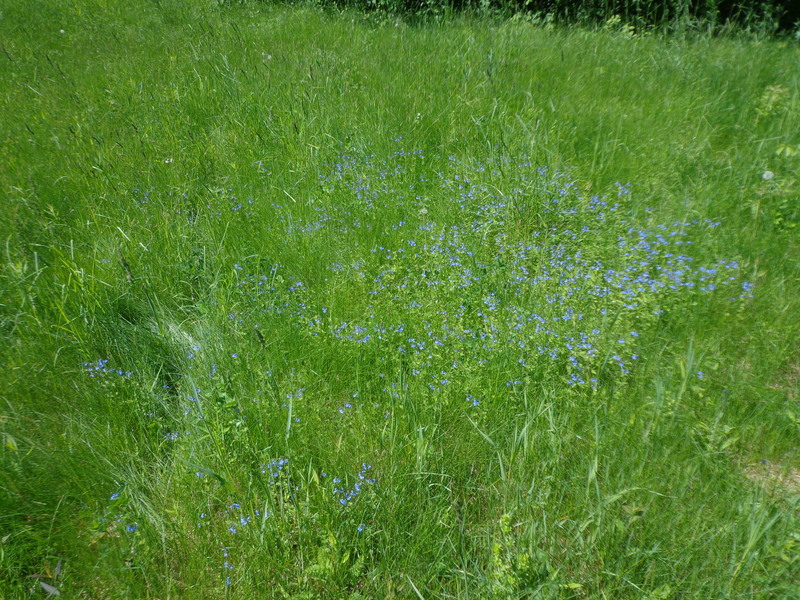 Every late spring a shady corner of the hayfield is bright blue with the flowers of a pretty weed. 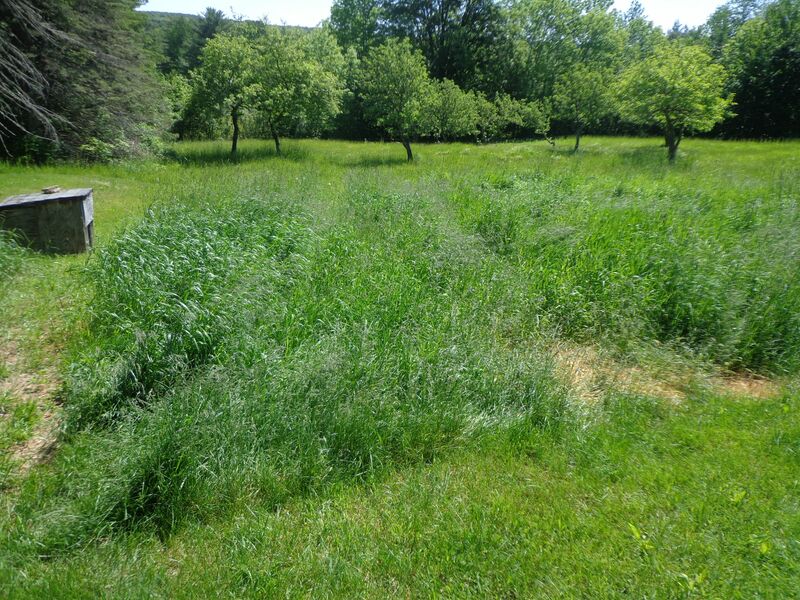 The area is about 5 feet square and has not increased noticeably in size over the years. Having learned my lesson from the yellow rattle about allowing pretty weeds in the hayfield, I decided to research this lovely blue flower. Turns out it is Germander speedwell, Veronica chamaedrys, a member of the Plantain family. 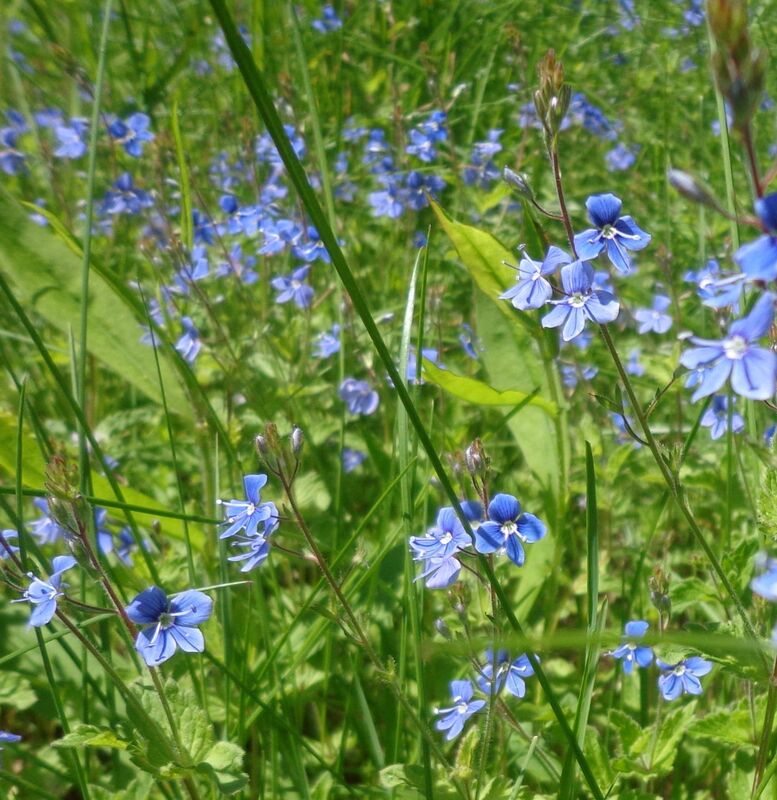 Germander speedwell was introduced to New England and is native to Britain and Europe. A perennial herb with rhizomes, it is termed a turf weed due to its tenacious ability to survive with grass. The name Germander has nothing to do with Germany. It is a corruption of the pronunciation of chamaedrys. The herb has a long association with healing and was well known and widely used over 500 years ago. The high tannin content of the leaves and stems makes an astringent tea that was favored for respiratory tract and nervous system ailments and as a treatment for stomach ulcers. It was also used as a poultice on the skin, especially for itching. The flowers are large for a turf weed, measuring a half-inch across. Each flower lasts only one day and wilts quickly on picking. This trait earned the plant the sobriquet Mannertreu or Men’s Faithfulness in Germany. Apparently German men had a reputation for short-lived faithfulness. During extended rainy spells, the flowers do not open. They are able to self-pollinate. In France the plant was often used as a substitute for Asian tea, due to a similar smell and flavor, and went by the name Europe Tea. The seeds are said to be favored by birds. Because this weed can out-compete grass, I will be keeping a close eye on it. 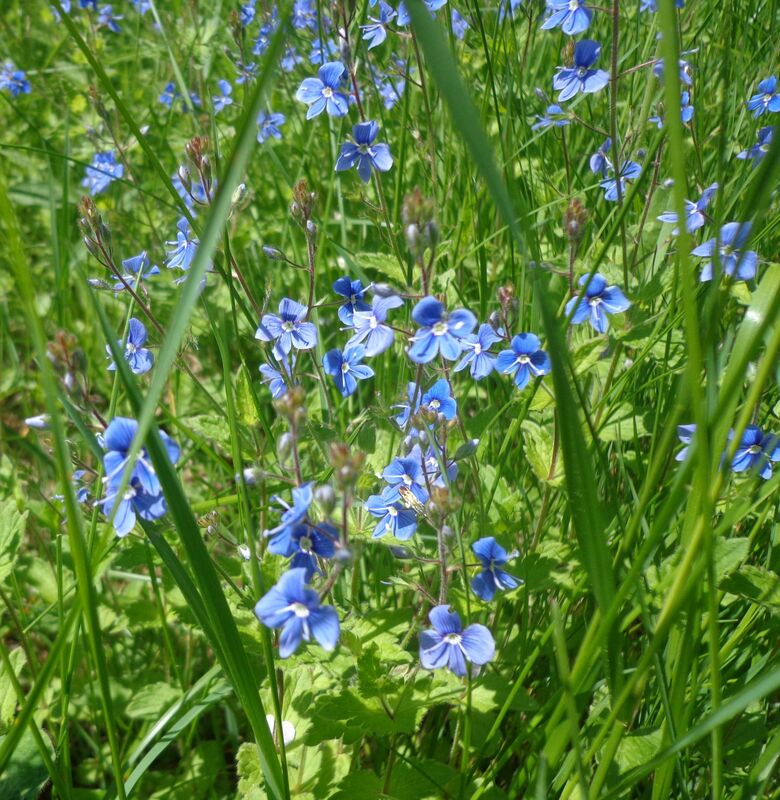 Should the size of the patch increase, I will mercilessly eradicate the little speedwell. So far the plant has restricted itself to one shady spot under an ancient maple and causes no problem in the field. This morning while I was doing chores I heard a loud, insistent peeping cry coming from the area of an apple orchard about 150 ft from the barn. Just two days ago I put the newest chick hatch in the barn and the babies are now 10 days old. Fearing one had somehow gotten out and been chased, as any mother would, I went searching for the baby. 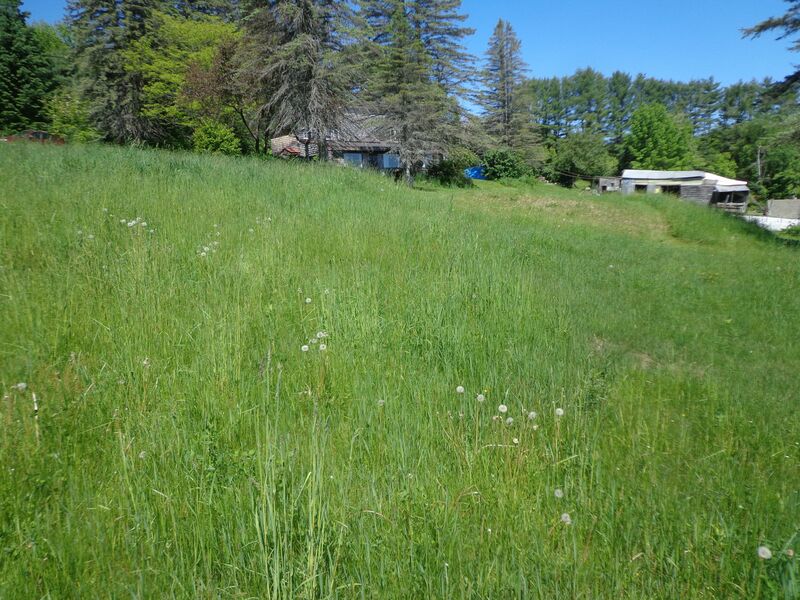 Closing in on the peeping brought me to an area of grass up to 3 ft high, part of the hayfield. As I got near, the calling stopped. I stood for a bit and heard the cries again, coming from the grass. So I searched all through the tall grass making mother hen noises, but the baby didn’t respond. I stopped and waited. Tiny muted peeps sounded very near. Finally I found the source, hidden in the grass. 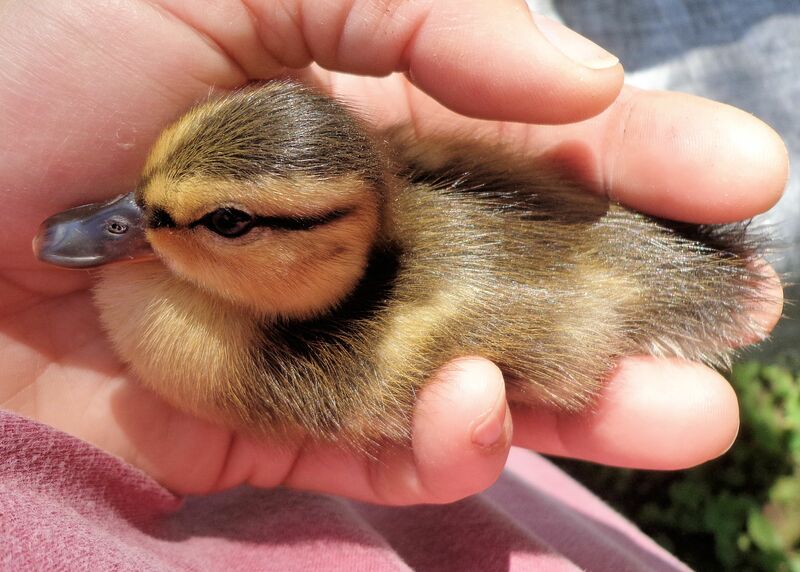 A baby duck! What in the world is a tiny duckling doing so far from any water? There was no mother duck in sight or earshot. The baby appeared perfectly healthy with no sign of injury. It was a strong, active bird, taking every opportunity to try and slip from my hand. This duckling was too young to survive on its own. It didn’t even have any feathers, only down. Before calling the wildlife rehabilitators, I decided to investigate on my own. The nearest water was our farm pond, about 300 ft away. I had seen ducks there during the spring, but had never seen a hen with a brood in our pond at any time. 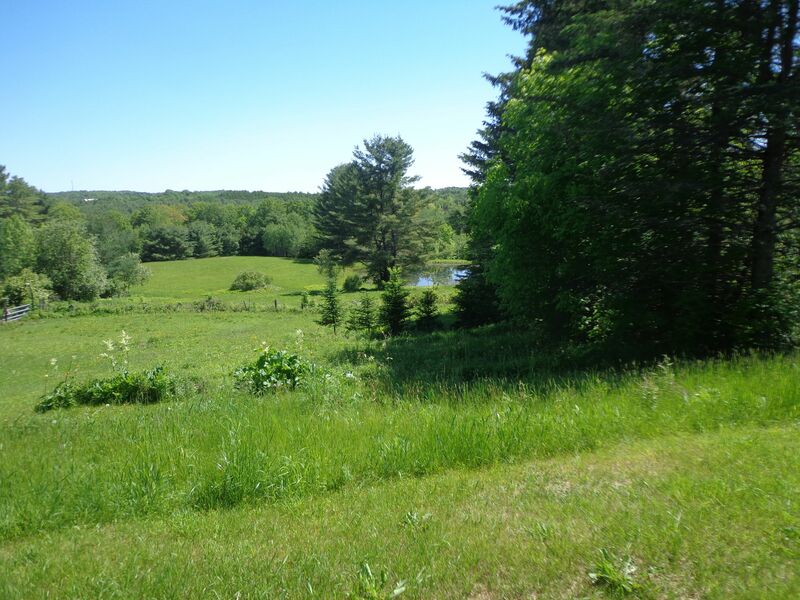 This seemed unlikely since the pond is only 1/6 acre, not very large. 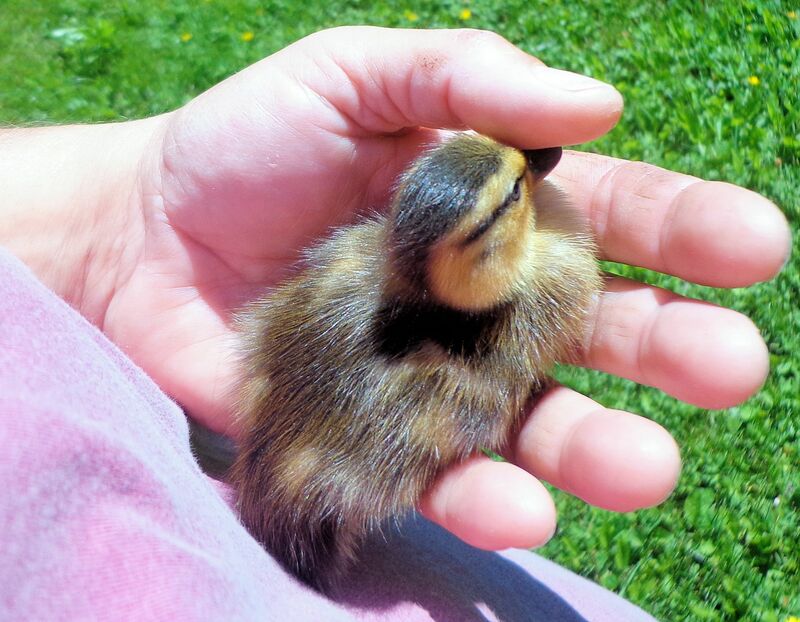 Cradling the duckling, I hiked to the pond. All appeared quiet. The only birds in evidence were a pair of very angry red-winged blackbirds loudly scolding. I was undoubtedly getting far too close to their nest hidden among the cattails. Suddenly there was movement in the flotsam on the far side of the pond. Then a hen mallard duck and her brood emerged from the weeds. What do you know?! A family of ducks was calling our pond home! Careful to move slowly and not frighten the ducks, I carried the baby to a spot close to its mother and released it. 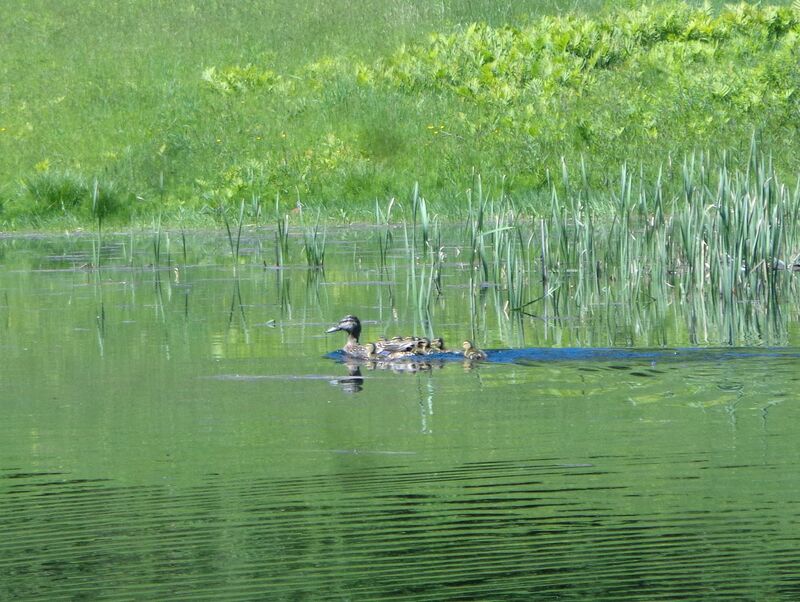 The duckling practically flew across the surface of the water, it swam so fast, peeping all the while for mama. And mother duck called back with a low quacking. Soon the family was reunited. That baby was one lucky duck! The best explanation I can find for having a duckling so far from its mother was that a predator, likely a bird such as a hawk or raven, picked the baby up off the pond. Using the same survival skills it demonstrated while I was restraining it, the baby may have played dead causing the predator to relax its grip. The little duck could then twist and slip from the predator’s talons to drop into the tall grass. Far from mom and the pond. 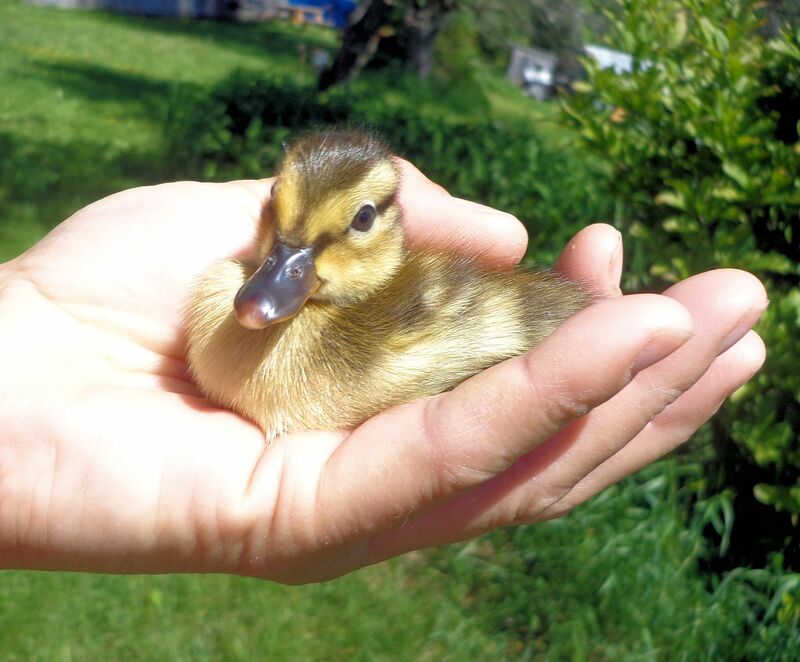 The duckling is one of many wild birds that I have saved from imminent death over the years. It has been my privilege to also rescue an owl, a bald eagle, a hummingbird and several song birds. 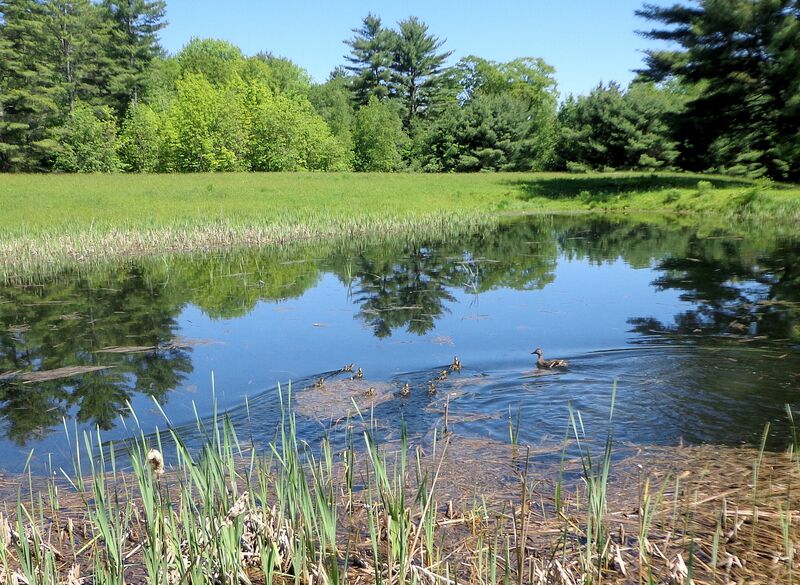 I’m delighted to have wild ducks live at our pond. What fun it will be to watch them grow and to share the sight with my granddaughters! I was thinking of taking my kayak out in the pond for a paddle, but I guess that will have to wait. The first time I tried mushy peas was in England at a Harry Ramsden restaurant in Bournemouth, something I wrote about in March 2015. The flavor was very similar to green pea soup, except the concoction was much thicker than soup. Mushy peas served with fish and chips, lamb or meat pie is a traditional favorite in the British Isles. My last blog about mystery peas inspired me to try my hand at making this British staple. There are various schools of thought surrounding the preparation of mushy peas. Some cooks feel any peas will do and they use frozen garden peas, adding cream to thicken. Others staunchly maintain that only marrow fat peas soaked in soda water will result in the authentic dish. Marrow fat peas are not well known in the US. These are merely regular garden peas that have been allowed to ripen on the plant until the pods dry. The peas are large and starchy by that stage of maturity. For my recipe, I tried to remain authentic by using dried whole organic peas that, when rehydrated, do taste a bit past the picking prime. 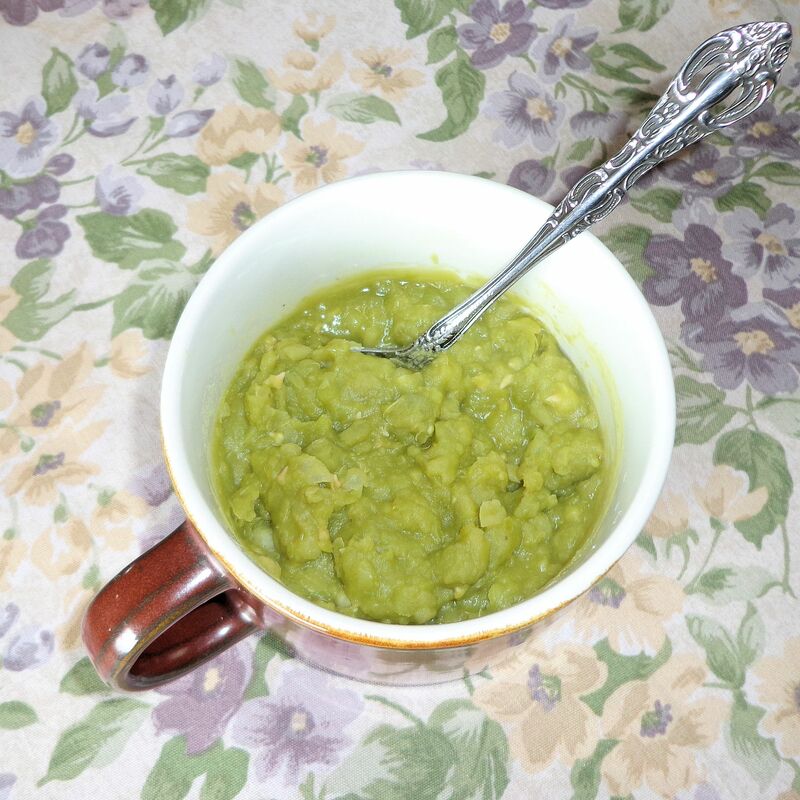 Mushy peas are not difficult to make, but they require at least two days to prepare. Leftovers can be refrigerated for a day or two, or frozen. They are the true inspiration for the Pease Porridge nursery rhyme. This dish is also known as pease porridge in the UK. Here is my recipe, adapted from various versions. Place soda in a 2 qt glass container, add water and stir to dissolve. Sort and rinse peas, add to water, assure the peas are well covered with water. Let set overnight, or at least 12 hours, uncovered. I let them set in the refrigerator. Check after about 8 hours and add more water, if necessary to allow the peas enough fluid to properly rehydrate. Some cooks recommend adding the water hot, I don’t find that necessary. After the peas have absorbed enough water to be soft, drain, rinse and place in 3-4 qt cooking pot. Add enough water to cover the peas. Bring to a boil then reduce the heat to low and simmer for approx. 30 minutes, periodically stirring gently to prevent sticking to the bottom. The idea is to soften the peas, but still maintain at least some of the seed shape. The peas should be partially turned to paste with plenty of whole pea lumps. Toward the end of the cooking time, monitor closely to prevent burning. During the simmering, add a small amount of water from time to time, if the porridge seems too thick. Remove from heat and season to taste with salt and pepper. Some also add a little sugar and/or fresh mint. Make various additions as desired, including onion, chive, garlic, etc. This dish is versatile. Serve the mushy peas hot. They can be enjoyed as a vegetable or as a starch serving. Makes about 6 cups. Just a quick personal note: I’ve found it necessary to use Beano when eating a good serving of mushy peas. Otherwise, my body has a rather unfortunate reaction to large quantities of legume.